Electronics Costs > How Much Does a Hard Drive Cost? How Much Does a Hard Drive Cost? To save files on a computer, you will, of course, need a hard drive, and whether your current one is faulty or you’re looking to expand your storage, the market is flooded with many brands and capacities. The cost of a hard drive will depend on the capacity, the brand, the device, the type and where it’s purchased from. For example, an external HDD hard drive that you can connect to a USB port can cost anywhere from $100 to $160 for a 1TB drive. An internal HDD hard drive that is connected using an SATA cable inside the computer with the same capacity can cost $80 to $160. For example, the Western Digital 2TB USB hard drive costs close to $200. A 1TB internal HDD hard drive will cost $60 to $150, while a 500-gigabyte HDD internal hard drive can cost anywhere from $40 to $65. A 250-gigabyte HDD internal hard drive is going to cost $35 to $55. 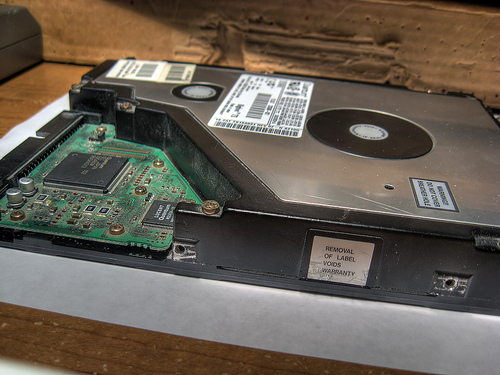 Laptop hard drives will often be similar in price when compared to a desktop version. An SSD drive, which is faster at writing data than the traditional HDD drive, can retail for $90 to $140 for a 250 to 500GB drive. To budget, plan on spending $0.05 to $0.07 per GB for an HDD drive and about $0.30 to $0.40 per GB for an SSD drive. A portable hard drive, which can be taken from one computer to another, can range from $75 to as much as $200 depending on the capacity and brand. A hard drive for a gaming console such as the Xbox 360 will cost around $20 to $50, depending on the capacity. The PlayStation 3 hard drive can retail for around $30, and since this console is outdated, most of these hard drives will have to be purchased used. A MacBook hard drive can actually be cheaper than a Windows-based desktop. Depending on the capacity, most MacBook hard drives will retail for $60 to $85 for a 500GB hard drive. The iMac hard drive replacement can be $150 to $200 for a 1TB hard drive. There are two types of hard drives on the market: a hard disk drive (HDD) and a solid state drive (SSD). An SSD will function the same way as an HDD, but it will use something known as flash memory, which will store the data instead of spinning metal disks like an SSD. To put it in perspective, think of it as a simple thumb drive. Compared to an HDD, an SDD will be faster at reading and writing data, it will use less power and will make next to no noise. While they are more expensive, the lifespan is longer. With security, some hard drives will hold your data and do nothing else, while secure hard drives will add an additional layer of security, which may automatically backup your data to another source for you. Data drives come in two form factors: the 3.5-inch and 2.5-inch drive. Desktop HDDs will be 3.5-inches, on average, with a maximum capacity of about 4 terabytes, while a laptop HDD will be 2.5-inches and will have a maximum capacity of about two terabytes. SSDs, however, will be made smaller because it won’t require as many movable parts such as the spinning moveable disk. These drives will be 2.5 inches in size, but if you need to fit a 2.5-inch SSD in a 3.5-inch HDD drive, adapters are made. As far as connections, both drives will use a SATA connection, but if the HDD drive is much older, it may use an IDE connector instead. External drives will almost always use a USB port. With storage, as noted above, HDD drives usually cap out at about four terabytes of storage, while SSD drives rarely break the 512GB mark. The transfer speeds will depend on many factors, but the higher the RPM is, the faster the data will transfer. When the drive needs to transfer data from one section of the hard drive to another, this is referred to as cache space. The larger the number this is, the faster the hard drive will be able to transfer this data. Cache space numbers will be within the 8MB to a 127MB range. Lastly, hard drives will either be external or internal. External drives will be perfect for those who want to store or backup their data. These drives will connect to a USB cable and will be portable, making it very easy to share data with other computers. Internal drives will just that — inside your computer. These hard drives will be installed inside your computer and will be housed in a case. The cost to install/replace a hard drive via a professional can be in the $30 to $60 range. While it isn’t necessarily considered an additional cost, data recovery, if needed to restore files, can cost up to $1 per GB. In 1980, the price of a gigabyte was $437,500, and by 2016, the price dropped to less than two cents. Consider investing in an SSD drive, even though it may be $40 to $60 more. These drives, as noted above, will be faster at reading and writing data. As a whole, modern data SSD drives have an average failure rate of 2 million hours, while an HDD has an average failure rate of 1.5 million rates; however, for long term storage, HDDs are more reliable than SSDs. Consider looking out for sales or even coupon codes from various online retailers. If you find a particular drive you like, consider using Google Shopping to see if it’s offered elsewhere for a lower price.